We, HOMOphonia, are a collective determined to lend a voice to people forced to hide because their sexual life is not tolerated by the society. Gay, lesbians, bi, trans, queer, all of us having deeply felt what oppression is, are the "gruesome" ones, striving to come to light. We, the members of HOMOphonia, come from a variety of backgrounds, and we have walked different paths. However, what unites us are fundamental values, such as respecting and recognizing each human being as unique individuals without exception. Human dignity, freedom of thought and action, equality, democratic processes and solidarity among people are our “core elements” for the building of a world without discrimination, without branding and without a single person at the margins of society. We are here to keep alive the flame that was lit in Stonewall, in 1969, by the rise of New York's gay and transgender community. 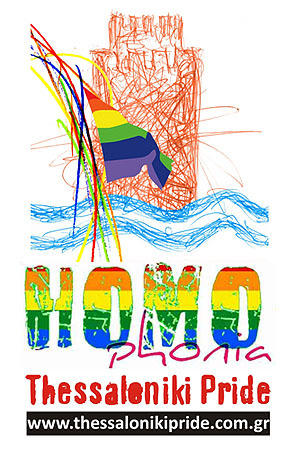 We decided to organize the first Pride in the city of Thessaloniki, as a symbol of our loyalty to the spirit of the ones who had the guts to shout: “no more” during more difficult times. Our journey towards organizing the Pride, is inspired by exactly this sense of humanism; this is why we stand by every person suffering from oppression and discrimination – women, adolescents, the elderly, people with special needs, people who are HIV positive, immigrants, refugees, people with different religious backgrounds, atheists; these people are more vulnerable because of who they are. Through organizing Pride, we wish to shout out for all rights we are deprived of, i.e. for the right to get married, to adopt children, to inherit from our partner and to leave inheritance to them; but what we mainly want is to be accepted exactly as we are. Despite the formal freedom we "enjoy", we are still subjected to physical and psychological violence, as well as to suppression by the state. Going out onto the streets of the city once a year is not enough for us; we want our voice to also reach the schools. Sexual education must develop children's minds from a young age, so that they may also respect and accept the homosexual/transgender identity. There should not be a standard of “normal”, but rather an established value and richness of diversity. "The more human we become, the more we differ". We want the mass media to show us just like we are in reality: lively and well-rounded people, not some caricature characters triggering easy laughter. We are a democratic collective. In our meetings, we openly discuss all matters, and settle disagreements in consensus. Any person who takes responsibility for a task, presents his/her progress to the meeting once a week. HOMOphonia also welcomes anyone wishing to fight against the oppression of any person as a result of their sexual identity/orientation. In this sense, we cooperate with collectives having the same fundamental principles, without any competitive relationship between us. Anyone sharing our goals and feeling that there are things uniting us, is welcome to walk with us. Anyone not feeling this way, can walk his or her own path. We will walk our path to the end. A path of joy and creation, bringing our fight to fruition and defending human dignity; because "to all questions, the answer is, and will always be, the human being".